Requirements: glibc >= 2.3.3, gtk 2.x, X server (the root user must be able to access a display). Additionally, Linux i386 requires glibc with TLS (thread local storage) support. 1. Download the SAP MaxDB software package for your Linux platform. 2. Open a root shell. 3. Change to the directory that contains the SAP MaxDB package you have downloaded. 4. Unpack the SAP MaxDB package. 6. Choose Start SAP MaxDB Installation. 7. Follow the instructions of Installation Manager. 8. After finishing the installation, exit the root shell. 10. If necessary, add it to the login profile of the operating system user as well (for example, .bash_profile in the user’s home directory). Database Studio is the SAP MaxDB GUI tool for managing databases. From SAP MaxDB version 7.7, Database Studio replaces the tools Database Manager GUI and SQL Studio, and also offers a GUI for the Loader tool. Database Studio can also be used for managing databases of versions 7.5 and 7.6. Database Studio uses the Eclipse platform (Eclipse 3.2); the required Eclipse software is part of the Database Studio installation package. To use Database Studio, you also need Java version 1.5 or higher. 3. Download the Database Studio software package for Microsoft Windows to a local directory. 4. Go to the directory that contains the software package you have downloaded. 5. Follow the instructions of the Installation Manager. For the following steps, you need root privileges. 3. Download the Database Studio software package for Linux to a local directory and extract it. 4. Go to the directory where you have extracted the software package. 6. Follow the instructions of the Installation Manager. Note: Linux system environments vary greatly, meaning that you might have to install additional system software for Database Studio to run properly. If you are having trouble starting Database Studio, we recommend that you have a look at the posts in the SAP MaxDB forum (for example this one: Re: DatabaseStudio 7.8.01.10 on Linux doesn’t start). It’s not actually SAP issue; relevant to Eclipse. Make sure that XULRUNNER package is installed. Please correct the path of “xulrunner” if different. 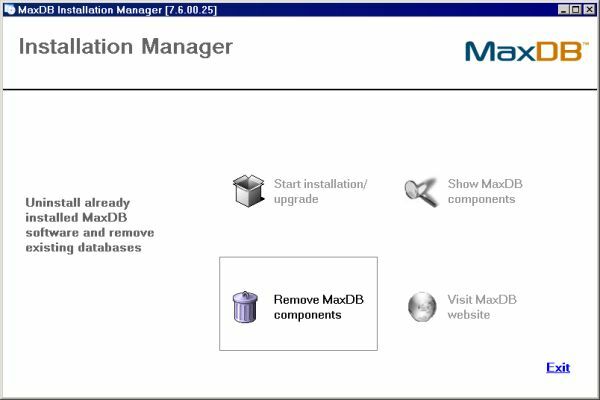 To uninstall the SAP MaxDB software, including databases and tools, you also use SAP MaxDB Installation Manager. 1. Exit all SAP MaxDB programs. 2. On Linux only: open a root shell. 3. Change to the directory where you have extracted the SAP MaxDB Installer package. 4. To start Installation Manager, run SDBSETUP. 5. Choose Remove MaxDB components.